Mention “teatime,” and you’ll evoke a cavalcade of images and sentiments that transport the imaginer to an Edwardian setting, complete with footmen, dowagers, elegant tea sets, and helpings of clotted cream, small cakes, and thin sandwiches. But “tea” is a term that has long referred to several different meals. Teatime is the usual time at which the tea meal is eaten, normally late afternoon to early evening (4 to 6 p.m.). The custom originated in the 1840s amongst England’s wealthy classes: Anna Maria Russell, the seventh Duchess of Bedford and one of Queen Victoria’s ladies-in-waiting, is credited as transforming the afternoon tea into a late-afternoon meal (in order to ward off hunger between lunch and dinner, which was being served later in the day). By the late 19th Century, both the upper and middle classes of Britain were observing afternoon tea. For the privileged, delicate savories accompanied the meal: egg-and-cress or cucumber sandwiches, scones served with clotted cream and jam, and pastries. Afternoon tea is known by several names, including “low tea” (which refers to the low chairs and tables). It shouldn’t be confused with “high tea,” also called “great tea” or “meat tea,” which is another name for the evening meal. It is normally associated with the British working classes and is eaten between 5 and 7 p.m. Afternoon tea owes its modern popularity to changing meal times. Originally, tea—which was believed to be good for digestion—was consumed after dinner, a meal that was eaten at midday. But during the late 1700s, the upper classes began to take the afternoon meal later in the day, first at around 6:30 or 7:00 and then progressively later. Tea-drinkers who were left waiting for their after-dinner “cuppa” began to get impatient, especially now that the end of dinner could be at 10 p.m. So tea moved from an after-dinner event to one that came before dinner. In 1662, Catherine of Braganza married England’s King Charles II; the new Queen’s preference for tea was instrumental in popularizing it throughout Britain, and helped spread its appeal among Englishwomen (its popularity in male-frequented coffee houses would have made it less socially acceptable for women to drink without the Queen’s example). During the late 1800s, London became the center of the international tea trade. The demand for tea led to a huge increase in the demand for porcelain. Tea consumption fueled the search for a European answer to Chinese porcelain, which was first produced in England around 1745 at the Chelsea Porcelain Manufactory. When tea first arrived in England, the leaves traveled from China alongside intricate instruments and techniques, including the ritualistic aspect of brewing tea in a certain way. As tea’s popularity grew, it moved out of public teashops and became a beverage that was consumed at home. Although traditionalists questioned whether drinking tea would lead women to gossiping, by the 19th century it was an established part of everyday British life. 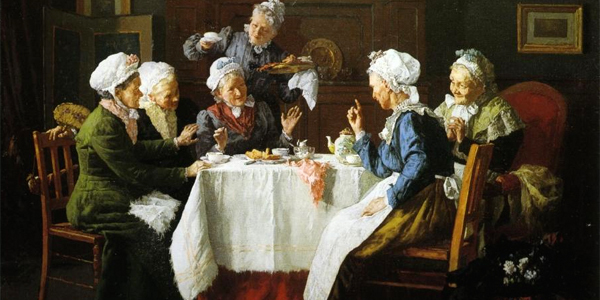 Although all classes enjoyed drinking tea, the custom maintained its association with proper living and good manners: afternoon tea originated in that social sphere, and would remain associated with the upper class and sophistication. 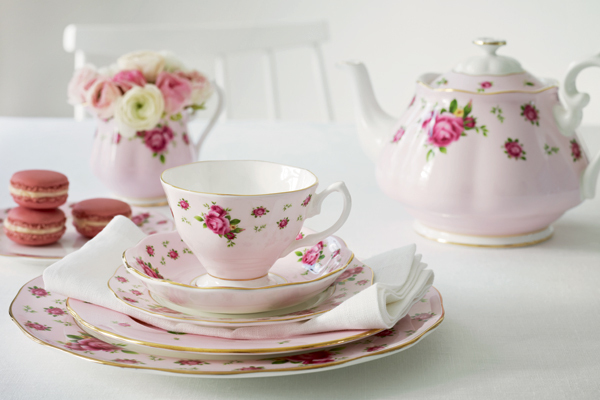 This entry was posted in Collector's Spotlight and tagged Royal Albert, Teatime.